What is the update to the EJ DE8911 vs a DE89 ? I am trying to decide what to pursue between the two EJs. They both share the same head and shave equally good. The handles are aesthetically different, just that. Pick up the one that you prefer. No matter what EJ razor you buy the head is the same so the difference is the handles. Some are fancier then others thus the price difference. What Oversatrun said,but Ill personally go for the DE8911 Barley. 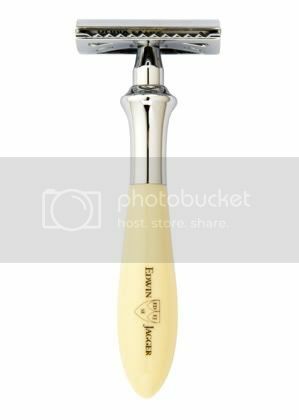 EJ DE8911 has an unlined handle and the end pays homage to the ball end tech. I have both the DE8911 and the DE89. Exactly the same except for the end of the handle. Both very nice razors. I can load a different blade into each and know which is which just be looking at the end of the handle. Makes blade comparison very easy as far as a de89 goes. (04-06-2012, 04:28 PM)Teiste Wrote: What Oversatrun said,but Ill personally go for the DE8911 Barley. When I bought my DE8911 I did not know they made a Barley version. Having seen one on another of Teiste's posts, I think the DE8911 Barley looks spectacular! Just another reason to buy another razor. RAD is good. Once you get hooked up with the Edwin Jagger/Muhle razors,there is no turning back...enjoy them! Teiste, I have to agree. I currently have 3 current manufacture razors, a DE89, a DE8911 and a Feather AS-D1. All 3 are fabulous razors. I learned wetshaving about a year ago using my DE89. I've spent the past 3 months trying several vintage razors I own and I think it's just about time to revisit the DE89. As my technique is still improving, I may be plesantly surprized going back to the DE89, one of my favorite razors. I have 2 razors in que as my next razor aquisitions, A NEW long comb with a Bull Mastiff XXL handle with the flared knob as I recently tried a NEW long comb razor and love it. The other razor in que to purchase is this one from Edwin Jagger. The Edwin Jagger Plaza truely is a beautiful razor. I'm a fan of DE89 razors too. Really good razors. (04-08-2012, 03:05 PM)R0B Wrote: I'm a fan of DE89 razors too. Really good razors. awesome! share a pic when you get the chance, let us all see! Below some pics of the EJ head + iKon Bulldog handle. Click the thumbnail for larger picture.